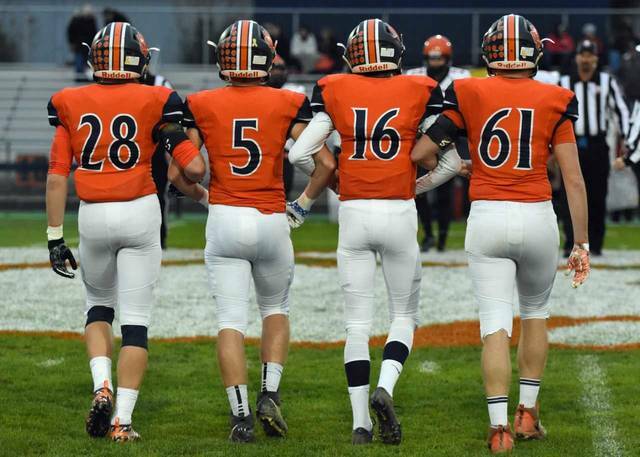 GALION — In week eight football action, the Galion Tigers welcomed the North Union Wildcats to Unckrich Stadium for a Mid-Ohio Athletic Conference clash in the Tigers’ annual homecoming game. 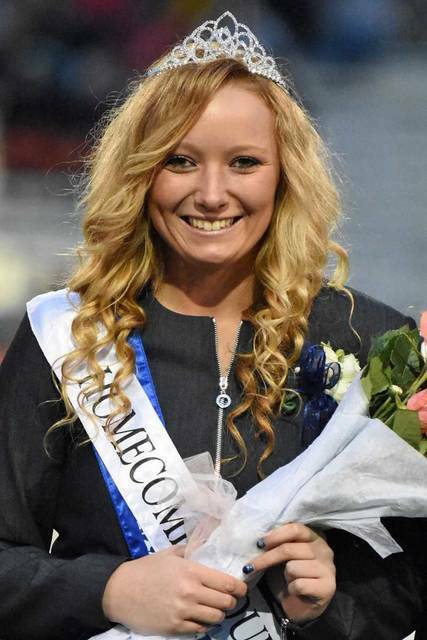 Three-sport athlete Gracie Groves was named the 2018 Galion Homecoming Queen and was handed the crown from the 2017 winner, Marisa Gwinner. Unfortunately, the weather and the Wildcats’ running attack would be too much for the orange and blue and Galion was defeated by North Union; 49-35. With the loss, the Tigers fall to 4-4 overall and now sit at 1-4 within the MOAC while the ‘Cats improve to 6-2 on the season and 3-2 in league play. Galion will play their home finale in week nine against the visiting Ontario Warriors (3-5, 1-4) while North Union will travel to Delaware for a clash with the Buckeye Valley Barons (4-4, 4-1). On Friday, it took the visiting Wildcats just 41 seconds to march down the field and score first thanks to a 25-yard touchdown run by Trevyn Feasel. Anthony Padovano would miss the extra-point but North Union grabbed the early, 6-0 advantage. Less than four minutes later, the ‘Cats would score again as Carson Smith scampered in from eight yards out and with the Padovano PAT, the visitors were up 13-0. Galion would respond quickly though as Kalib Griffin took the ensuing kickoff 85 yards for the special teams score and after Dominic Pittman converted the PAT, it was 13-7 ‘Cats. The scoring in the first was far from over though as Trevon Moran got in on the scoring for North Union with a three-yard run and the visitors went ahead 20-7 after Padovano’s extra-point. Continuing with the back and forth of the opening quarter, the Tigers would strike again as quarterback Elias Middleton connected with wideout Isaiah Alsip for a 41-yard touchdown. Pittman booted the PAT through and with 3:45 left in the first, Galion cut the North Union lead to 20-14. A minute later, Feasel ran in his second score of the opening 12 minutes, this time from 10 yards out. Moran ran in the two-point conversion attempt and the Wildcats expanded their lead; 28-14. Nearly five minutes would pass in the second quarter before Moran added his second rushing touchdown on the night from five yards out while Padovano made it 35-14 with another extra-point. Not to be outdone, Middleton would score Galion’s only score of the second on a four-yard run with 3:03 remaining in the half. Pittman converted another PAT and the Tigers would head into halftime down; 35-21. Moran would pound the ball in from three yards out for the only score in the third quarter with Padovano making it 42-21 with another PAT. Galion would need less than three minutes to get on the board in the final quarter as Middleton and Alsip teamed-up again, this time for a 54-yard aerial strike and after Pittman’s PAT, the ‘Cats lead was down to 42-28 with 9:26 remaining in the game. However, Moran would score again for visiting North Union, carrying the ball in from the 20 and after the PAT, it was a 21-point lead for the Wildcats; 49-28. In a last stitch effort for a comeback, Middleton scampered in for a five yard score and Pittman booted the PAT but with 2:46 remaining, the game found its eventual score of 49-35. North Union went off against the Galion defense, racking up 579 total yards of offense with 555 of those coming via the running game. The Tigers notched 363 yards (223 passing, 140 rushing) of offense in the loss. The visitors controlled the ball for 27:36 on the night with the home team having the ball for 20:24. Middleton finished with 223 passing yards with a 13/24 of completion rate, leading to two touchdowns to Alsip. Middleton also picked up 94 yards on 24 carries for two TDs. Alsip was once again Middleton’s primary target, catching seven passes for 150 yards and the two scores. Alsip also picked-off a North Union passing attempt, of which they only attempted two on the evening. Trevor O’Brien caught two passes for 31 yards on the night while Griffin snagged two catches for 17 yards to go along with his kick return score. 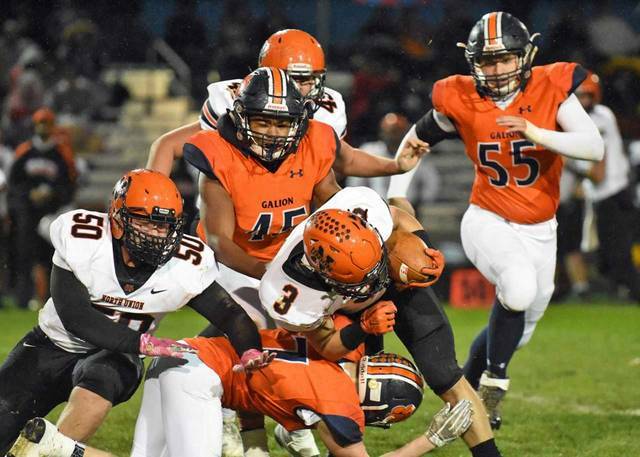 Colbey Fox managed 27 yards on five carries and Hanif Donaldson rounded out the offense for Galion, carrying the ball once for 24 yards while catching two passes equating to 25 yards. The Wildcats had three runners gain more than 150 yards on the ground, led by 210 yards from Moran on 28 carries. Feasel had 18 attempts leading to 198 yards and Smith racked up 153 yards on 18 carries. In other week eight action in the MOAC Friday, the Clear Fork Colts (8-0, 5-0) cruised to a 54-14 at Ontario. Pleasant (7-1, 4-1) bounced back from last week’s upset and defeated River Valley (3-5, 2-3); 42-0. The only team to defeat the Spartans, the Buckeye Valley Barons (4-4, 4-1), handed the Harding Presidents (1-7, 0-5) a 27-13 loss.